Chummy returns for Xmas and series six. As filming commences on the Christmas Special and series six of, Call The Midwife, the BBC has revealed casting and further details of the new episodes – including the return of a much-loved character. The Christmas episode will be set and filmed on location near Cape Town, South Africa, as the nurses of Nonnatus House receive an SOS from a tiny mission hospital, Hope Clinic. Understaffed, underfunded, with a poor water supply and faced with closure. and faced with closure and run by Dr Myra Fitzsimmons, played by guest star Sinead Cusack. By the time the mission trip is over, the medics and midwives are both shaken and exhilarated by the challenges – with some lives permanently changed. 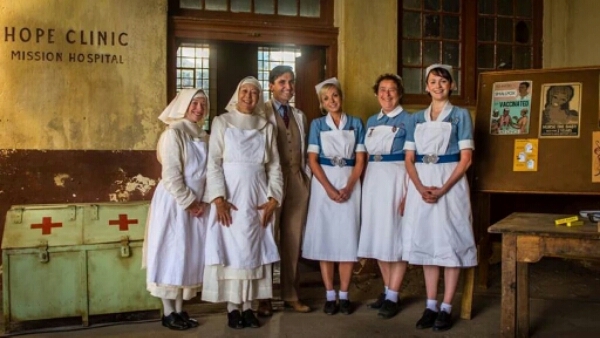 The sixth series will then return to the UK for eight new episodes to be filmed on location at the historic Chatham dockyard, London’s East End, and Call The Midwife’s studio base in Chertsey, Surrey. It is now 1962, and the Nonnatus House team are as committed to caring for the people of Poplar as always. However, the social revolution in the outside world is mirrored by change and challenge much closer to home. As they strive to help mothers and families cope with the demands of childbearing, disability, disease and social prejudice, our beloved medics must make choices – and fight battles – of their own. Series six will see them laugh together, cry together, and pull together, supporting each other as never before. Miranda Hart returns to her role as Chummy, making an appearance in the Christmas Special, before returning to Nonnatus House from the first episode of series six. Returning cast include: Jenny Agutter, Linda Bassett, Miranda Hart, Judy Parfitt, Helen George, Bryony Hannah, Laura Main, Emerald Fennell, Charlotte Ritchie, Victoria Yeates, Kate Lamb, Stephen McGann, Jack Ashton, Ben Caplan, and Cliff Parisi. Made by Neal Street Productions, the hit drama is inspired by the memoirs of the late Jennifer Worth, and created and written by Heidi Thomas. Call The Midwife Christmas Special will air in 2016, with the sixth series following in 2017.